FSX Insider | FlightSimCon 2016 Ready For Departure! 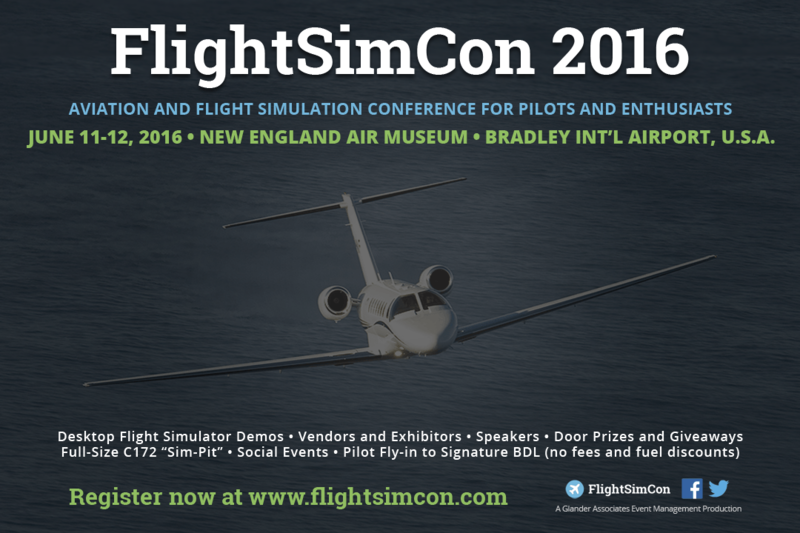 Hartford, CT, USA – FlightSimCon 2016 is just a month away! The flight simulation world is gathering at the New England Air Museum on June 11 and 12. Registration is available at www.flightsimcon.com. For just $60, attendees can get full, 2-day access to the conference, all events, and to the New England Air Museum’s impressive collection of display aircraft. Discounts are available for students, student pilots, and groups. Register this week; rates go up on May 16. The conference has confirmed 46 sponsors and exhibitors. Some of the highlights include Orbx, PILOT’S, Aerosoft, A2A Simulations, Jetline Systems, Boston Virtual ARTCC, VATSIM, IVAO, REX Game Studios, Dovetail Games, FS Flight Control, FltPlan.com, MidContinent Airlines, Captain Mike Ray, FSFX Packages, QualityWings, Javiator, EasternHops, GoFlight, Appropel, FlightSim.com, AirDailyX.net, PC Pilot, and LiveATC.net. The speaker list features some of the biggest names in the flight simulation world, including Peter “Frooglesim” Wright, Stephen Hood, Reed Stough, John Venema, and many more. There are 10 presentations and 2 panel discussions scheduled throughout the weekend. Great prizes are available to be won at the conference, including games from Big Fat Simulations, a round-trip flight with Cape Air, DVDs from JustPlanes.com, headsets from David Clark, and TrackIR 5 PRO bundles donated by Natural Point. Now in its fourth year, FlightSimCon has quickly become the biggest flight simulation and aviation conference in North America, drawing attendees from around the world. Registration is open now at flightsimcon.com. If you are passionate about aviation, flight simulation, and flying, join us this June! FlightSimCon is held just outside of Bradley International Airport, which offers non-stop and connecting service across the United States and the world. The host hotel for the event, the Sheraton Hartford Hotel at Bradley Airport, is located inside the airport terminal building. If you are a pilot, FlightSimCon has partnered with the Signature FBO at Bradley Airport to offer fuel and parking discounts. Please contact Signature directly (860-623-4955), and reference FlightSimCon when booking. For more information, travel details, and to register, visit www.flightsimcon.com. Please also like FlightSimCon on Facebook or follow the conference on Twitter for the latest updates. By Mike Singer – 28 June 2007 It took longer than we all expected, but Barrington Irving is finally home….